Tomorrow, Penny Dreadful enters the world. Hoorah! To celebrate, I’ve been wanting to publish a book list. 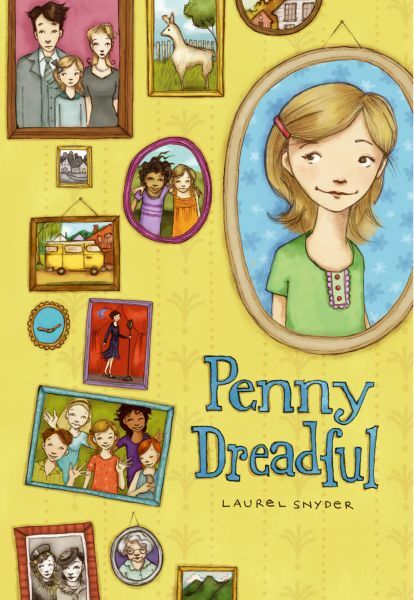 A list of extra-awesome books for non-reluctant-readerly kids. The sort of kids who like Penny. The sort of kids like Penny. I’d like to offer free skype visits to any group of five or more readers who gather to read five or more titles from this list (details on the PENNY DREADFUL BOOK CLUB to come). But then, yesterday, I read this awesome essay by Maureen Johnson, and decided to own this project, this list. These are, for the most part, girlie books. I’m, for the most part, a girlie writer. I admit it. I think that’s a fine thing to be! So here you go. The first draft of a work-in-progress. The Penny Dreadful Reading List! These are “Penny’s Picks” though I hope you’ll leave comments below, help me add to the list. They’re from all eras, and I’m trying to arrange them in some kind of vague order, so that the top books are the youngest books, and the bottom books are the oldest. I should explain that I only selected one title from any individual author. I want to believe that a kid will still, after reading a great book, go out and dig up everythng else by that author. I certainly did that myself, and so does Penny. I should also explain that I am only including books I’ve actually read. So if you really think I should add a specific title, let me know, but it may take me awhile to add it because I’ll need to read it first. I assume you’ll all take issue with some of my choices. I welcome that. Go! We can make this list as long as we want. Naturally, the book is a book for children, about seagulls and the midatlantic and divorce and magic and poetry, and a breadbox, and… well, your songs. The book is not for you. It is for my parents. But I couldn’t have written it without you, I don’t think. I owe you something. I stole a lot of lines from you to write this book. I stole a lot of feelings. I only wish I could send you a copy. Can I send you a copy? Next year: Wean yourself off coffee before Rosh Hashanah, so as to avoid HORRIBLE HEADACHE ON YOM KIPPUR. The amazing Jewish picture book exhibit, Monsters and Miracles, is making its way east. If you;re in the northeast, and have any interest in Jewish life OR the history of the picture book, you really need to go. It’s astounding, and I’m honored to have a small part in it. Another trend is seen in picture books offering alternative narratives of American Jewish life. Among these are Laurel Snyder’s forthcoming Baxter, the Pig Who Wanted to Be Kosher (2010), illustrated by David Goldin; Daniel Pinkwater’s forthcoming story in Yiddish and English, Beautiful Yetta: The Yiddish Chicken (2010), illustrated by Jill Pinkwater; and Lemony Snicket’s unconventional holiday tale, The Latke Who Couldn’t Stop Screaming: A Christmas Story (2007), illustrated by Lisa Brown. Back from the road (for a minute) and it was a wonderful trip. I got to spend some time with my family, and I got to have the holiday with my dad, at the synagogue I grew up with (and that grew up with me). But I also got to visit LITITZ! One of the most adorable towns in the world, which is home to Aaron’s Books, one of the best bookstores in the world, sponsor of one of the most fun children’s book festivals in the world! It was great to hang out with Sam, Todd, and Aaron (the family that owns the shop) as well as the other authors. Plus, Lititz House, the B&B where I stayed was a dreeeeeeam. But perhaps the most incredible thing about Lititz is the chocolate factory at the center of town. I didn’t get to tour it, but it didn’t matter, because everywhere you go there is chocolate. Yes, indeed, there are WILBUR BUDS all over town. People pretty much pelt you with them. You HAVE to eat them. If you didn’t you would be rude. Which is why I came home 7 pounds heavier than I left. It is NOT MY FAULT! I don’t have pictures of the trip, sadly, because I left my camera with Mose, a budding photographer, so you’ll have to go peek at Mitali’s. But really, it was a wonderful trip, and I am deeply grateful to Aarons! The holidays have kept me from blogging about it, but I am on my way to an amazing children’s book festival in Lititz, PA.
Building upon the popularity of the store’s first festival in 2009, Aaron’s Books is expanding the event locations, adding a fundraiser for local literacy programs, and providing a focus on diversity in children’s literature. Scheduled events for the weekend include a local author’s night, story time with picture book authors and illustrators and special guest Mother Goose, open signing times with the authors, a panel discussion on diversity in literature, an editing workshop for aspiring writers, and a dinner with authors to raise funds for Lancaster Reach Out and Read programs. All events are open to the public and all are free except the Saturday dinner. Please, if you’re nearby, come say hello! The boys and I are in a dented van right now, driving up 81, looking for something yummy to eat (but not McDonalds. I swear this time NOT McDonalds!) or maybe something fun to do (see above). Or we are yelling at the top of our lungs, contemplating an early-stop-for-the-night at a HOJO. Because we can. Or we are peeing by the side of the road. Truly, there’s nothing like a Jewish holidays. Can’t you just feel that magic tingle in the air? It’s 4 in the morning, and I’m awake because I crashed early last night, because I was absolutely plumb tuckered out. The Decatur Book Festival chewed me up and spit me out like a… well, like a bit of fish bone on the edge of a plate, if fish bones were tired, and appreciative, and messy-haired, and named Laurel, and awake at obscene hours (okay, so maybe not a fish bone at all). On the first day of the festival, I got up early to drive Jeanne Birdsall and an old friend of hers around town. They were both lovely! After that, I taught a fun class in how plot can spring from character. In between the two I ran away from the festival and hung out with Marc Fitten over lunch, picked my boys up at school so I could bring them home for a snack, then dashed away again to meet the adorable Deb Ager for a drink/chat. In the evening, when this was all done, I ate too many garlic french fries with Jessica Handler and Joshilyn Jackson and some other nice people I hadn’t met before, and ended my (too late) evening with Janet Geddis and her wonderful Jim (I don’t know Jim’s last name) and Susan Rebecca White and Allen Deutschman at Cakes and Ale, which was a little too delicious and wine-full. I was supposed to go see Franzen, and I felt very bad for missing it, but garlic fries and a terribly long line at the event were obstacles I could not overcome. On the second day of the festival (which was really the first full day of the festival), I spent the morning with the amazing Joyce Maynard, whom I’ve known in the abstract for a long time (she gave me an essay for Half/LIfe). But until this week, we’d never met in person. Of course she was terrific and I wanted to kidnap her and bring her home to hang out, but that would have been odd, right? So instead I ran off and participated in a high-energy, overwhelmingly well-attended panel about social media with Jessica (see above) Collin Kelley, Karen Head and Jef Blocker. Awesome Atlanta folks! Ron Hogan came, which made me nervous because, really, what do I have to tell Ron about “social media?” After that Richard Nash (ditto) dropped in, and we wandered around together, and I think I hugged him four times because I knew he had to run away again and he’s on the short list of people I don’t get to see as often as I’d like. Sigh. Then I went and heard some good good poems, by Bruce Covey and a brilliant woman whose name I didn’t catch, but want a book by (who were you, lady with the bun and shorts?). Then I went home and wrestled with the kids and did some dishes, and kissed my husband, and rested, and swung by my young friend Ford’s birthday party (he’s six!) before heading to Feast (and here I really have to stop name-dropping, because there were just too many names at the party. It was CRAZY!) But the most important was that I got to squeeze both Deborah Wiles and Terra McVoy, who are actual friends, and not just famous writers who make me nervous. After that we trickled over to Twain’s, where I saw Jamie “wonderful” Allen and met some great folks, including Blake Butler, who I almost had a fight with, but then decided was smarter than me, and Lev Grossman, who ate a Reuben and was unintimidating because I didn’t know who he was at first. Also a hilarious and smart man with a beard, from McSweeney’s, whose name I didn’t catch, but it was one of those things where it became “too late” to ask him to repeat it. (please, bearded man, forgive me, and tell me your name!) Believe it or not, I went home sober after all that. I had to drive, and like, function, the next day, and stuff. On the third day of the festival, I slept in and made French toast for my kids, because I felt guilty about how much I’d been gone the previous two days (and also because French toast is yummy). Then we goofed off for a few hours, and read the paper and drank coffee, because–you know, Sunday. After that, the kids and I (and my darling husband) went in to Decatur together, where we ate lunch and the boys saw some “boomtroopers” and the mysterious bearded man from McSweeney’s gave Lewis a BOOK (which is a special book that I will post about later)! Then I ran off to listen to the Reuben-eating Mr. Grossman, who knocked my socks off! (I might have to write a different post just to enumerate the precise ways in which my socks came off. Suffice it to say I will be reading the Magicians this week) Then I headed back to the Children’s Stage, where I had a “conversation” (on a stage, moderated and microphoned) with Jeanne Birdsall, about how writers strive to make magic real, and reality magical. It was scary and exciting and the crowd was wonderful. But my 11 year old fried Helen was there, so everyone else faded into the background (because I would HATE to disappoint Helen, whom I admire). Except Miss Birdsall did not fade into the background! She is a generous warm intelligent woman, and now I want to reread the Penderwicks. After I signed a lot (yay!) of books (though they had SOLD OUT of Baxter) and bumped into Ingrid Law, who is very sweet, and friendly, and has a nice laugh, I went with Joanna, my friend who keeps me sane, to a quiet place, to decompress, with a single sippin’ whiskey. Also I bought a coat. It is a very very nice coat. Or maybe you can teach me some stuff instead! I’d like that. Tomorrow, at the Decatur Book Festival, I’ll be leading a workshop. I’m mainly going to focus on why/how character needs to be the driving force in a book. We’ll talk about why you can’t usually begin with a plot. Someone (or something) cute has a problem, and feels safe in the world when someone else solves it. Someone (or something) unappealing is transformed. Yay! A series of seemingly random events end nicely, usually in bed. Eh? Eh? Prove me wrong. You are currently browsing the Laurel Snyder blog archives for September, 2010.